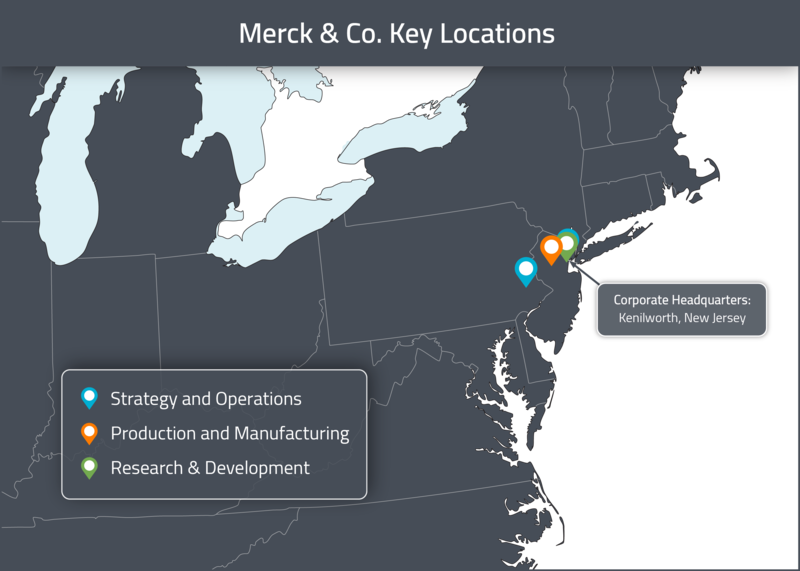 Mapping Merck: A map for Selling to Merck & Co.
Merck & Co. is an American pharmaceutical company, ranked 4th internationally in the world in terms of 2017 prescription sales . It is important to note that Merck & Co. is a wholly separate and independent company from the German company Merck KGaA, despite the fact that the two share a common origin and brand name. The first business using the name of “Merck” was a single drug store in Darmstadt, Germany, purchased by Fredrich Jacob Merck in 1668 . By the 19th century, the German business had evolved into a major pharmaceutical company and was famously the first commercial producer of morphine. The first American subsidiary of Merck was established in 1891, when Georg Merck emigrated to the United States. During World War I, the German company lost its subsidiaries abroad and the US subsidiary was expropriated by the US government (confiscated under the Trading with the Enemy Act of 1917). Therefore, Merck & Co. became an independent American company in 1917. In 1919, the Merck family repurchased the company’s stock, but Merck & Co (Merck USA) remained a separate company from the German founding organization. To this day, Merck & Co. holds the trademark rights to the "Merck" name in North America, while the German company (known as Merck KGaA) retains the rights in the rest of the world. Disputes over use of the name “Merck” and branding confusion have emerged in recent years . Our goal with this article is to help companies looking to partner with Merck & Co. to understand exactly how and where decisions are being made within the organization. To accomplish this, we will give a brief business overview, provide some highlights about their outsourcing history and show the distribution of their global drug development sites and decision makers. Finally, we will close off with a summary of their strategies for innovation. At the end of 2017, Merck & Co had approximately 69,000 employees internationally . About 39% of their workforce is located in the United States (including Puerto Rico). Merck & Co’s operations outside the United States (e.g. in Latin America, the Middle East, Africa, Eastern Europe and Asia-Pacific) are conducted primarily through subsidiaries and account for 54-57% of the company’s sales. Pharmaceutical sales for Merck in 2017 amounted to $35.4 billion USD (including animal health products: $40.1B). The company has about 50 prescription products currently on the market. Their therapeutic areas of expertise are cardiovascular disease, respiratory disease, oncology, neuroscience, infectious diseases, immunology and women's health. In 2017, Research and Development accounted for $10.2 billion USD in expenses for Merck & Co. As of November 2018, their pipeline included 37 programs in Phase II or later . Drug candidates currently in development span multiple disease areas, including oncology, cardiovascular diseases, diabetes, infectious diseases (including vaccines), neurosciences, obesity, pain, and respiratory diseases. 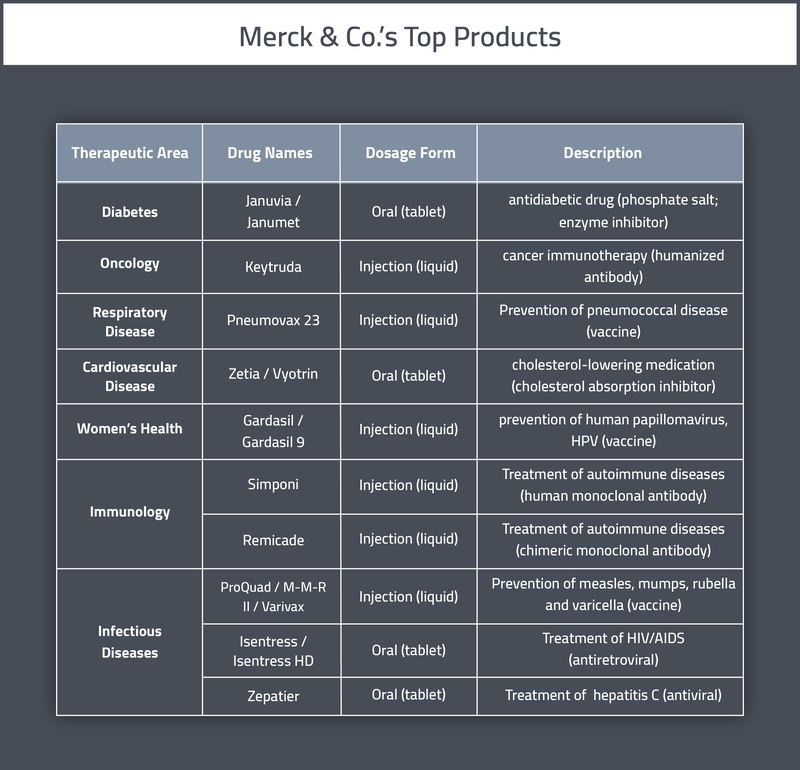 A table summarizing Merck’s top-selling pharmaceutical products can be found below. Merck & Co relies on third parties for key aspects of its business including research & development, manufacturing, commercialization and information technology systems. The company partners with suppliers, other pharmaceutical and biotechnology companies, and various third party service providers. Many pharmaceutical companies, in an attempt to reduce costs and increase capacity, are choosing to reduce in-house manufacturing. Merck & Co has recently decreased their manufacturing footprint by outsourcing up to 40% of their active pharmaceutical ingredient (API) supply to contract manufacturers . A recent partnership between Merck and a contract research organization was their 2012 contract with CMO Akrikhin for the manufacturing of 6 branded drugs in their facility near Moscow . Nonetheless, Merck & Co still maintains several of their own manufacturing facilities and even performs some outsourcing itself. For example, they recently invested $60M into their site in Brinny, Ireland to manufacture biologic APIs to service clients of contract development & manufacturing organization Fujifilm Diosynth Biotechnologies (as part of a long term collaboration between the two firms) . They also entered into a 15-year manufacturing capacity-sharing agreement with MedImmune in September 2011 . Clinical trial outsourcing is also on the rise for Merck & Co. In 2008-2009, the company outsourced about 10% of its clinical trials. By 2013, about 50% of their trials were outsourced. According to a 2013 statement by the VP of Global Clinical Trial Operations, Merck’s programs for biosimilars, respiratory disease, diabetes and hypertension are almost entirely outsourced . For example, in 2011, Merck & Co entered into a strategic alliance with Paraxel (a global pharmaceutical services provider) for the development of biosimilars . When looking for CRO partners, Merck considers level of science & technical abilities, history with respect to regulatory inspections, leadership/personnel within the CRO, overall infrastructure, current capacity and expansion capabilities. They prefer to use a limited number of providers and develop a strong working and communication relationship with them; once a program is placed with a CRO, they rarely move work on that program to other CROs . 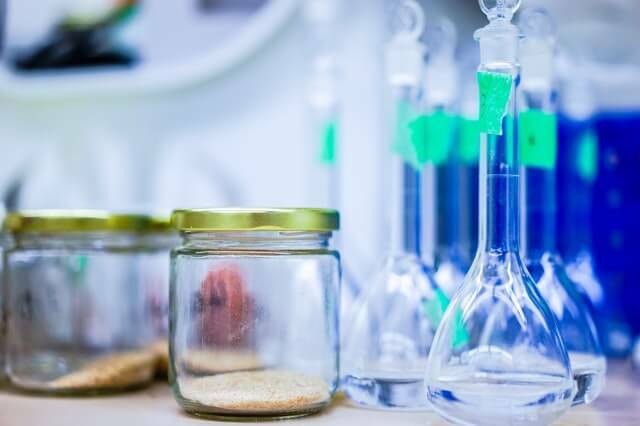 Merck & Co frequently enters into collaborations with firms to help them develop promising drug candidates, to make use of bioanalytical expertise or promising technologies for discovering new drug candidates. For example, in 2018, they partnered with Japanese firm Eisai for the worldwide co-development and co-commercialization of Eisai’s product Lenvima  and, in 2016, they entered into an expanded licensing deal with Moderna Therapeutics Inc., regarding their revolutionary immune-based cancer-fighting technology . Merck & Co has also been partnered with Italian CRO IRBM since 2010 in order to borrow their technology for discovering peptide-based therapeutic candidates . Merck & Co also outsources their information technology systems demands. From 2005 to 2015, they were partnered with HCL Technologies for a diverse range of services, including transformational software-led IT solutions, infrastructure management, and business & knowledge process services . Prior to that, they were partnered with Cognizant with a full suite of services including applications outsourcing, IT infrastructure management and business process outsourcing services . Have a Zymewire account? 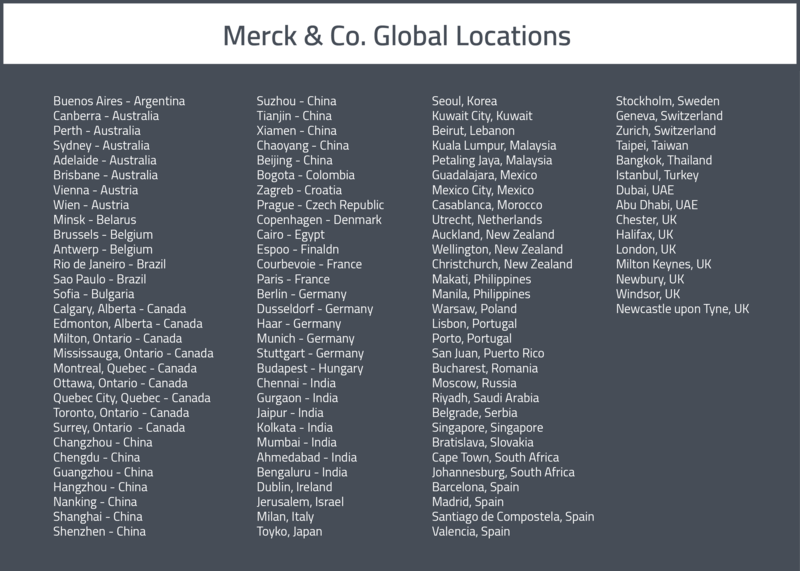 Click here to view Merck & Co.'s global activity! Merck & Co’s corporate headquarters is located in Kenilworth, New Jersey. The Company’s U.S. commercial operations are headquartered in Upper Gwynedd, Pennsylvania. This office also where the vaccines business is conducted. Their U.S. pharmaceutical business is conducted through the divisional headquarters located in Upper Gwynedd, Pennsylvania as well as in Kenilworth, New Jersey . About 12,650 employees handle Merck & Co’s research activities internationally. Principal U.S. research facilities are located in Rahway and Kenilworth, New Jersey, West Point, Pennsylvania, Palo Alto, California, Boston, Massachusetts, and Elkhorn, Nebraska (Animal Health). Principal research facilities outside the United States are located in Switzerland and China . Merck & Co’s manufacturing operations are headquartered in Whitehouse Station, New Jersey. The Company also has production facilities for human health products at nine locations in the United States and Puerto Rico . Outside the United States, through subsidiaries, the Company owns or has an interest in manufacturing plants or other properties in Japan, Singapore, South Africa, and other countries in Western Europe, Central and South America, and Asia . 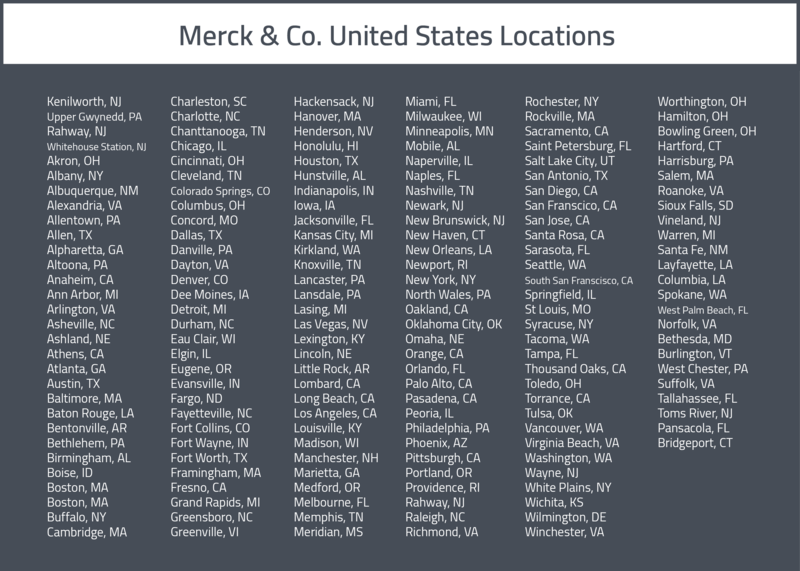 A complete list of Merck & Co’s locations is given below, as per https://craft.co/merck-&-co/locations? Decision making has been classified into three sections: clinical outsourcing, manufacturing and logistics. This division should facilitate outreach efforts by different types of companies looking to conduct business with Merck & Co. In general, North American decision making seems to take place primarily in the Greater Philadelphia and Greater New York City areas. European decision making is very spread out, for all types of decision making. In Asia-Pacific, the clinical and logistics decisions appear to take place in Japan, China, Australia and India, whereas manufacturing decisions take place moreso in China and India. Where are their clinical outsourcing decisions based out of? In North America, clinical outsourcing decisions are largely based out of the Greater Philadelphia Area and the Greater New York Area. In the Greater Philadelphia Area, there is a Manager of Clinical Outsourcing, a Director of Preclinical Outsourcing and multiple Associate Directors of Clinical Research. In the Greater New York Area, there is an Associate Director of Global Analytical Outsourcing and multiple Clinical Study Managers. Elsewhere in the United States, there is an Associate Director of US Clinical Research in Washington (DC) and multiple Clinical Trial Managers in Raleigh (NC). Finally, in Canada, there are several Directors of Clinical Research in Montreal, QC. In Europe, clinical outsourcing decision making is scattered across the continent. In Brussels (Belgium), there is a Director of ESD Operations and Outsourcing. In Paris (France), there is a Regional Clinical Director. In Russia, there are Associate Directors of Clinical Research in St Petersburg and Moscow. In the United Kingdom, there are Senior Clinical Directors in London and Enfield. Also in the United Kingdom, there are Associate Directors of Clinical Operations in Birmingham and Harrow. In Sweden, there is also an Associate Director of Clinical Operations in Stockholm. In Italy, there is a Director of Clinical Development in both Rome and Milan. In Madrid (Spain) there is an Executive Director of Clinical Research. Finally, in Turkey, there is a Clinical Research Director. In APAC, decision making takes place in Japan, China, Australia and India. In Gurgaon (India), there are multiple Directors of Clinical Research. In Shanghai and Beijing (China), you’ll find Associate Directors of Clinical Research. In Tokyo (Japan), there are multiple Clinical Directors. Finally, in Sydney (Australia), you’ll find multiple Associate Directors of Clinical Research. Where are their manufacturing decisions based out of? North American manufacturing decisions are also primarily based of the United States. There are multiple Directors of External Manufacturing and Directors of Manufacturing based of the Greater Philadelphia area. In San Francisco (CA), there are multiple Associate Directors of External Manufacturing. Finally, in Raleigh (NC), there are multiple Directors of External Manufacturing. European manufacturing decisions are also scattered across the continent. In Dublin (Ireland), there are multiple Directors of External Manufacturing. In Switzerland, there are multiple Directors of External Manufacturing in Lucerne and Zurich. In Madrid (Spain) and Clermont-Ferrand Area (France), there are several Directors of External Manufacturing. There are also several Directors of External Manufacturing in Italy, in the Pavia Area. Finally, in Rome (Italy), there is a Director of External Manufacturing. Asia-Pacific has their manufacturing decision makers split across China and India. There is a Director of External Manufacturing in Shanghai (China) and an Associate Director of External Manufacturing in the Mumbai Area (India). 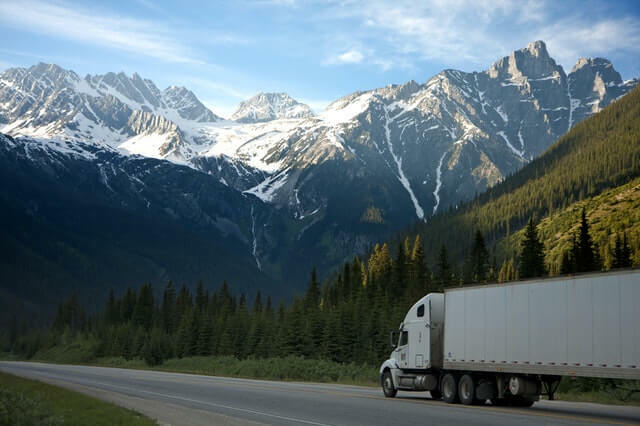 For North America, decision making for logistics is once again based primarily out of the Greater Philadelphia Area and the Greater New York Area. There are multiple Directors of Logistics and Directors or Procurement in both areas. In the Greater Philadelphia area, there are also multiple Global Supply Chain Management team members. In the Greater New York Area, there are multiple Directors of Supply Chain Management and there is a Global Procurement Director. There are also multiple Logistics Managers in the Raleigh-Durham area (NC). There are also many Directors of Supply Chain in the Greater Boston Area. Finally, in Mexico there is a Supply Chain Director. Once again, decision making in Europe is extremely spread out when it comes to logistics. Dublin (Ireland) has multiple Logistics Managers, Associate Logistics Directors and Directors of Supply Chain Management and there is also a Procurement Director. In Rome (Italy), there is a Logistics Director and an Associate Director of Procurement. In France, you’ll find a Global Logistics Director in the Clermont-Ferrand area and, in Paris, you’ll find the Head of Procurement and the Director of Global Procurement. In the Antwerp Area (Belgium), there are multiple Associate Directors of Global Logistics. In Stockholm (Sweden), there is a Logistics and Supply Chain Manager. In the Zurich Area (Switzerland), you’ll find a Director of Global Procurement. In Paris (France), there is a Head of Procurement and a Director of Global Procurement. Finally, in Madrid (Spain), there is an Associate Director of Global Procurement. For APAC, logistics decision making also takes place in India, China, Japan and Australia. In Mumbai (India), you’ll find a Senior Manager of Supply Chain, a Director of Supply Chain and a Logistics Manager. In Shanghai (China), there is an Associate Director of Supply Chain Management, a Global Procurement Manager and a Distribution & Logistics Manager. Finally, in Tokyo (Japan), there are multiple Directors of Procurement and in Sydney (Australia), there is a Procurement Manager. As is the case with most other major pharmaceutical companies, part of Merck & Co’s strategy for innovation is to establish its presence in innovation districts, such as Cambridge and San Francisco. In Cambridge’s Kendall Square neighborhood, they have founded the Merck Exploratory Science Center (MESC). This multi-disciplinary facility accommodates 40 researchers and is part of the Merck Research Labs (MRL)’g global network. It is located near some of the world’s leading colleges, research hospitals and biotech/pharma companies, while also being in proximity to Merck's Boston discovery research site. Cambridge is also where the MRL Ventures Fund (MRLV) is based. This $250M fund invests in innovative therapeutics companies globally . In San Francisco, MRL will also be opening a new, cutting-edge research facility in 2019, which will accommodate over 300 scientists . In addition to establishing a presence in traditional innovation districts, Merck & Co has also recently opened a state-of-the-art office in the heart of Austin, Texas . This office is located within the new medical school campus at the University of Texas (UT), and is meant to foster collaboration and creativity in a relaxed atmosphere. Their goal with this office is to encourage technology that will help drive Merck’s overall business outcomes. In line with this goal, they have also established a presence at Dell Med and at Capital Factory, in downtown Austin. Similar offices have been opened in Singapore, Prague and New Jersey (Branchburg) as well. Finally, augmenting their portfolio and pipeline with external innovation is also an important component of the Merck & Co’s overall innovation strategy. In accordance with this, Merck & Co has recently entered into some highly publicized partnerships with other big pharma companies for access to their molecules or for co-development of promising candidates. For instance, in 2014 Merck & Co partnered with Bayer to gain access to some of their cardiovascular therapeutics  and, in 2017, they entered into a partnership with AstraZeneca (AZ) to gain certain licence options on their oncology product Lynparza . In 2013, they also agreed to develop and commercialize biosimilars with Samsung Bioepis . 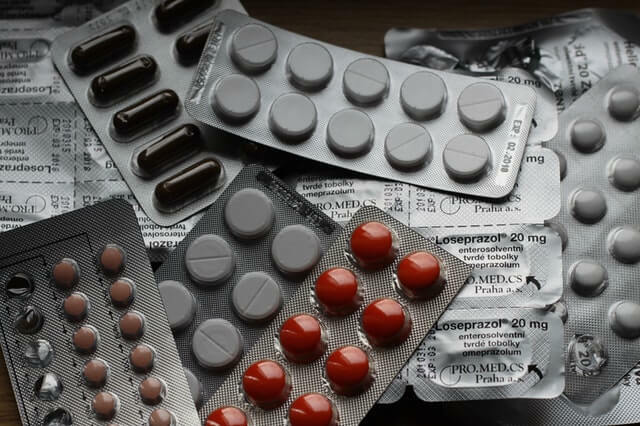 If you would like a simple solution for keeping an eye on drug sponsor companies, such as Merck & Co., without relying on a database and generic lists of leads each week, we at Zymewire are here to help. Reach out today, and stay tuned for the next instalment of Sponsor Atlas: Selling to the Pharma Giants. If you enjoy these articles, please feel free to give them a share! To view Part 6 of the Sponsor Atlas series, Anything but Generic: A map for Selling to Teva Pharmaceuticals, click here! Sponsor Atlas, Drug Sponsor, Pharmaceutical, Merck & Co.